Krazy Kuehner Days: What on Earth? I generally try to keep science and history/geography as group activities. But lately....ugh....the kids are fighting and it's easier to separate the boys and the girls. Then I have Joey who wants to learn one area, but the girls that are showing interest in another. What does that mean....more work for mom!!! I was very interested in the AIMS products, so I jumped at the chance to try out some of their curriculum choices. 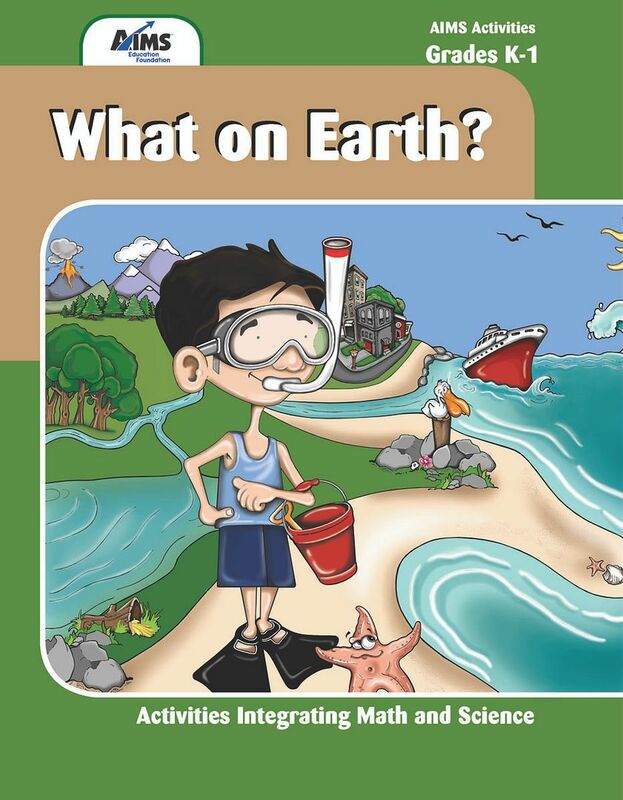 We received the Grades K-1 book, What on Earth? Earth Science, how perfect for two kids that love getting dirty!!!! And if we can throw in a little math too...great!! Each lesson gives you a key question to ask the students, learning goal, a list of materials for experiments, any work that needs to be done in advance, and suggestions as to how to handle the lesson. The CORE requirements that are being met are also listed. There are also reproducible worksheets/activities for each lesson. The girls have really enjoyed the activities so far. We have done a lesson a week so far, and there is minimal extra work for me. Mainly copying the activity for them, getting the supplies ready and just reading what we will be covering. Some of the activities at the end of the lesson did not interest the girls, so we actually would just talk about what the worksheet would be about. And then we would visit the library to find an easy reader book to go with that topic. These books are written to be used in a public school setting. But can easily be adapted into a homeschool environment. By doing our approach of checking the library for materials they could help me read, it really turned it into a classical/Charlotte Mason style education that we are fond of. By using this book though, the plan was basically laid completely out for me. Very little extra planning on my part. Our printed copy came with a cd-rom full of pdfs of various geographical features. The girls enjoyed flipping through these. I could also pick and choose the lessons we were using. Or you could plan your science curriculum around an entire book. It's your choice. Would I recommend AIMS materials to fellow homeschool families.....YES!!! The cost is minimal for each book...this text is listed for $21.95. How many homeschool science curriculums can you buy for that much? I have not seen any yet!! Minimal extra planning on my part, means kids are happily learning what they want. Not just begrudgingly going along with what another sibling wants. AIMS offers a wide selection of Science, Math, English/Grammar and even Spanish options. They have books from Kindergarten through 9th grade. With such a wide selection of printed and epublications, AIMS should be a series next on your list to check out as you are planning for next year. I know I will be using these more often, since I see how little work there is for me involved. How do you order? Visit the AIMS website. The cost of these materials do vary quite a bit. It depends on the title that you choose, and also they do sell materials that you would need for advanced level science experiments. Check out what other Crew mates thought of their AIMS products. *****Disclaimer......I received What on Earth? from AIMS free of charge for the sole purpose of this review. I was not required to write a positive review. The views I have expressed are my own and are real experiences with my family. I am disclosing this is accordance with the Federal Trade Commission's 16 CFR, Part 255 http://www.access.gpo.gov/nara/cfr/waisidx_03/16cfr255_03.html>:"Guides Concerning the Use of Endorsements and Testimonials in Advertising."